For the practices and social institutions of the Norse pagans, see Norse religion. Norse mythology is the body of mythology of the North Germanic people stemming from Norse paganism and continuing after the Christianization of Scandinavia and into the Scandinavian folklore of the modern period. The northernmost extension of Germanic mythology, Norse mythology consists of tales of various deities, beings, and heroes derived from numerous sources from both before and after the pagan period, including medieval manuscripts, archaeological representations, and folk tradition. Numerous gods are mentioned in the source texts such as the hammer-wielding, humanity-protecting god Thor, who relentlessly fights his foes; the one-eyed, raven-flanked god Odin, who craftily pursues knowledge throughout the worlds and bestowed among humanity the runic alphabet; the beautiful, seiðr-working, feathered cloak-clad goddess Freyja who rides to battle to choose among the slain; the vengeful, skiing goddess Skaði, who prefers the wolf howls of the winter mountains to the seashore; the powerful god Njörðr, who may calm both sea and fire and grant wealth and land; the god Freyr, whose weather and farming associations bring peace and pleasure to humanity; the goddess Iðunn, who keeps apples that grant eternal youthfulness; the mysterious god Heimdallr, who is born of nine mothers, can hear grass grow, has gold teeth, and possesses a resounding horn; the jötunn Loki, who brings tragedy to the gods by engineering the death of the goddess Frigg's beautiful son Baldr; and numerous other deities. Most of the surviving mythology centers on the plights of the gods and their interaction with various other beings, such as humanity and the jötnar, beings who may be friends, lovers, foes and/or family members of the gods. 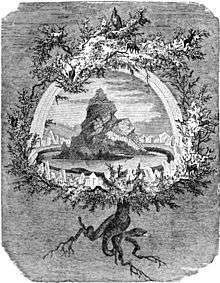 The cosmos in Norse mythology consists of Nine Worlds that flank a central cosmological tree, Yggdrasil. Units of time and elements of the cosmology are personified as deities or beings. Various forms of a creation myth are recounted, where the world is created from the flesh of the primordial being Ymir, and the first two humans are Ask and Embla. These worlds are foretold to be reborn after the events of Ragnarök, when an immense battle occurs between the gods and their enemies, and the world is enveloped in flames, only to be reborn anew. There the surviving gods will meet, and the land will be fertile and green, and two humans will repopulate the world. Norse mythology has been the subject of scholarly discourse since the 17th century, when key texts were brought to the attention of the intellectual circles of Europe. By way of comparative mythology and historical linguistics, scholars have identified elements of Germanic mythology reaching as far back as Proto-Indo-European mythology. In the modern period, the Romanticist Viking revival re-awoke an interest in the subject matter, and references to Norse mythology may now be found throughout modern popular culture. The myths have further been revived in a religious context among adherents of Germanic Neopaganism. Norse mythology is primarily attested in dialects of Old Norse, a North Germanic language spoken by the Scandinavian peoples during the European Middle Ages, and the ancestor of modern Scandinavian languages. The majority of these Old Norse texts were created in Iceland, where the oral tradition stemming from the pre-Christian inhabitants of the island was collected and recorded in manuscripts. This occurred primarily in the 13th century. These texts include the Prose Edda, composed in the 13th century by Snorri Sturluson, and the Poetic Edda, a collection of poems from earlier traditional material anonymously compiled in the 13th century. Objects from the archaeological record may also be interpreted as depictions of subjects from Norse mythology, such as amulets of the god Thor's hammer Mjölnir found among pagan burials and small silver female figures interpreted as valkyries or dísir, beings associated with war, fate, and/or ancestor cults. By way of historical linguistics and comparative mythology, comparisons to other attested branches of Germanic mythology (such as the Old High German Merseburg Incantations) may also lend insight. Wider comparisons to the mythology of other Indo-European peoples by scholars has resulted in the potential reconstruction of far earlier myths. Of the mythical tales and poems that are presumed to have existed during the Middle Ages, Viking Age, Migration Period, and prior, only a tiny amount of poems and tales survive. Later sources reaching into the modern period, such as a medieval charm recorded as used by the Norwegian woman Ragnhild Tregagås—convicted of witchcraft in Norway in the 14th century—and spells found in the 17th century Icelandic Galdrabók grimoire also sometimes make references to Norse mythology. Other traces, such as place names bearing the names of gods may provide further information about deities, such as a potential association between deities based on placement of locations bearing their names, their local popularity, and associations with geological features. Central to accounts of Norse mythology are the plights of the gods and their interaction with various other beings, such as with the jötnar, who may be friends, lovers, foes and/or family members of the gods. Numerous gods are mentioned in the source texts. 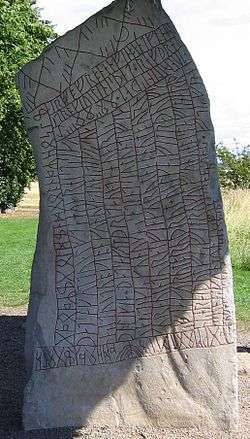 As evidenced by records of personal names and place names, the most popular god among the Scandinavians during the Viking Age was Thor, who is portrayed as unrelentingly pursuing his foes, his mountain-crushing, thunderous hammer Mjölnir in hand. In the mythology, Thor lays waste to numerous jötnar who are foes to the gods or humanity, and is wed to the beautiful, golden-haired goddess Sif. The god Odin is also frequently mentioned in surviving texts. One-eyed, wolf and raven-flanked, and spear in hand, Odin pursues knowledge throughout the worlds. 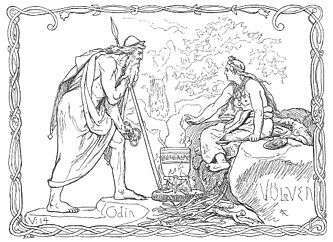 In an act of self-sacrifice, Odin is described as having hanged himself on the cosmological tree Yggdrasil to gain knowledge of the runic alphabet, which he passed on to humanity, and is associated closely with death, wisdom, and poetry. Odin has a strong association with death; Odin is portrayed as the ruler of Valhalla, where valkyries carry half of those slain in battle. Odin's wife is the powerful goddess Frigg who can see the future but tells no one, and together they have a beloved son, Baldr. After a series of dreams had by Baldr of his impending death, his death is engineered by Loki, and Baldr thereafter resides in Hel, a realm ruled over by a goddess of the same name. Odin must share half of his share of the dead with a powerful goddess; Freyja. She is beautiful, sensual, wears a feathered cloak, and practices seiðr. She rides to battle to choose among the slain, and brings her chosen to her afterlife field Fólkvangr. Freyja weeps for her missing husband Óðr, and seeks after him in far away lands. Freyja's brother, the god Freyr, is also frequently mentioned in surviving texts, and in his association with weather, royalty, human sexuality, and agriculture brings peace and pleasure to humanity. Deeply lovesick after catching sight of the beautiful jötunn Gerðr, Freyr seeks and wins her love, yet at the price of his future doom. Their father is the powerful god Njörðr. Njörðr is strongly associated with ships and seafaring, and so also wealth and prosperity. Freyja and Freyr's mother is Njörðr's sister (her name is unprovided in the source material). However, there is more information about his pairing with the skiing and hunting goddess Skaði. Their relationship is ill-fated, as Skaði cannot stand to be away from her beloved mountains, nor Njörðr from the seashore. Together, Freyja, Freyr, and Njörðr form a portion of gods known as the Vanir. While the Aesir and the Vanir retain distinct identification, they came together as the result of the Æsir–Vanir War. While they receive less mention, numerous other gods and goddesses appear in the source material. (For a list of these deities, see List of Germanic deities.) Some of the gods we hear less about include the apple-bearing goddess Iðunn and her husband, the skaldic god Bragi; the gold-toothed, white-skinned god Heimdallr, born of nine mothers; the ancient god Týr, who lost a hand while binding the great wolf Fenrir; and the goddess Gefjon, who formed modern day Zealand, Denmark. The cosmology of the worlds in which all beings inhabit—nine in total—centers around a cosmological tree, Yggdrasil. The gods inhabit the heavenly realm of Asgard whereas humanity inhabits Midgard, a region in the center of the cosmos. Outside of the gods, humanity, and the jötnar, these Nine Worlds are inhabited by beings, such as elves and dwarfs. Travel between the worlds is frequently recounted in the myths, where the gods and other beings may interact directly with humanity. Numerous creatures live on Yggdrasil, such as the insulting messenger squirrel Ratatoskr and the perching hawk Veðrfölnir. The tree itself has three major roots, and at the base of one of these roots live a trio of norns. Elements of the cosmos are personified, such as the Sun (Sól, a goddess), the Moon (Máni, a god), and Earth (Jörð, a goddess), as well as units of time, such as day (Dagr, a god) and night (Nótt, a jötunn). The afterlife is a complex matter in Norse mythology. The dead may go to the murky realm of Hel—a realm ruled over by a female being of the same name, may be ferried away by valkyries to Odin's martial hall Valhalla, or may be chosen by the goddess Freyja to dwell in her field Fólkvangr. The goddess Rán may claim those that die at sea, and the goddess Gefjon is said to be attended by virgins upon their death. References to reincarnation are also made. Time itself is presented between cyclic and linear, and some scholars have argued that cyclic time was the original format for the mythology. 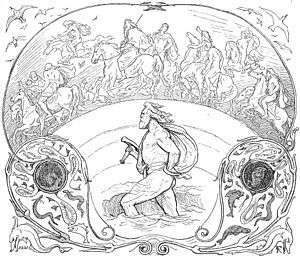 Various forms of a cosmological creation story are provided in Icelandic sources, and references to a future destruction and rebirth of the world—Ragnarok—are frequently mentioned in some texts. According to the Poetic Edda poem Völuspá and the Prose Edda, the first human couple consisted of Ask and Embla; driftwood found by a trio of gods and imbued with life in the form of three gifts. After the cataclysm of Ragnarok, this process is mirrored in the survival of two humans from a wood; Líf and Lífþrasir. From these two humankind are foretold to repopulate the new, green earth. With the widespread publication of Norse myths and legends at this time, references to the Norse gods and heroes spread into European literary culture, especially in Scandinavia, Germany, and Britain. In the later 20th century, references to Norse mythology became common in science fiction and fantasy literature, role-playing games, and eventually other cultural products such as Japanese animation. Andrén, Anders. Jennbert, Kristina. Raudvere, Catharina. (editors) (2006). Old Norse Religion in Long-Term Perspectives: Origins, Changes and Interactions. Lund: Nordic Academic Press. ISBN 91-89116-81-X. O'Donoghue, Heather (2007). From Asgard to Valhalla : the remarkable history of the Norse myths. London: I. B. Tauris. ISBN 1-84511-357-8. 1 2 Faulkes (1995), pp. vi–xxi, and Turville-Petre (1964), pp. 1–34. ↑ Faulkes (1995), pp. xvi–xviii. ↑ Turville-Petre (1964), pp. 27–34. ↑ Lindow (2001), pp. 11–12, Turville-Petre (1964), pp. 17–21, and MacLeod & Mees (2006), pp. 27–28, 216. ↑ Regarding the dísir, valkyries, and figurines (with images), see Lindow (2001), pp. 95–97. For hammers, see Simek (2007), pp. 218–219, and Lindow (2001), pp. 288–289. ↑ Lindow (2001), pp. 29–30, 227–228, and Simek (2007), pp. 84, 278. ↑ Puhvel (1989), pp. 189–221, and Mallory (2005), pp. 128–142. ↑ Turville-Petre (1964), p. 13. ↑ Regarding Ragnhild Tregagås, see MacLeod & Mees (2006), p. 37. For Galdrabók, see Flowers (1989), p. 29. ↑ Turville-Petre (1964), pp. 2–3, 178. ↑ Lindow (2001), pp. 287–291. ↑ Lindow (2001), pp. 128–129, 247–252. ↑ Lindow (2001), pp. 118, 126–128. ↑ Lindow (2001), pp. 121–122. ↑ Lindow (2001), pp. 241–243. ↑ Lindow (2001), pp. 311–312. ↑ Lindow (2001), pp. 86–88, 135–137, 168–172, 198–199, 297–299. ↑ Lindow (2001), pp. 99–102, 109–110, and Simek (2007), pp. 67–69, 73–74. ↑ Simek (2007), pp. 108–109, 180, 333, 335. ↑ Lindow (2001), pp. 95–97, 243–246. Simek (2007), pp. 62–62, 236–237, 349. ↑ Lindow (2001), pp. 319–332. Simek (2007), pp. 375–376. ↑ Lindow (2001), pp. 91–92, 205–206, 222–223, 278–280. ↑ For Hel, see Lindow (2001), p. 172, and Orchard (1997), p. 79. For Valhalla, see Lindow (2001), pp. 308–309, and Orchard (1997), pp. 171–172. For Fólkvangr, see Lindow (2001), p. 118, and Orchard (1997), p. 45. ↑ For Rán, see Lindow (2001), pp. 258–259, and Orchard (1997), p. 129. For Gefjon, see Orchard (1997), p. 52. ↑ Orchard (1997), p. 131. ↑ Lindow (2001), pp. 42–43. ↑ Lindow (2001), pp. 1–2, 40, 254–258. ↑ Simek (2007), p. 189.